Those are just a few of the unlikely recipes I found today in an old recipe box from Indiana. Other favorites include Lima Beans Au Gratin, Green Soup Plus, and a recipe attributed to “TV Hour Mag” called Carrot Chowder. Carrot Chowder features the unappetizing combination of one pound ground meat (type of meat unspecified), a lot of water, four cups of grated carrots and four cups of tomato juice. You couldn’t have created something more disturbing had you closed your eyes and dumped the first four things you touched in your refrigerator (make that your fridge after you’d just returned from a six week vacation) into a large soup pot filled with water. I’ve been meaning to rescue some recipes this week from the many wonderful recipe boxes I’ve been ordering from EBay. But these, it seems to me, should never have been exhumed. Nevertheless, the life of a woman who must have been a spectacularly bad cook interests me very much. The evidence is that hers was a pretty successful underground movement. Take “Green Soup Plus,” a recipe cut out of a newspaper and billed as “an elegant way to treat soup from the pantry shelf.” Its ingredients, beyond one can of condensed green pea soup, something I didn’t even know existed, are sour cream, curry powder and this shocker: flaked cooked crab. Crab on green pea soup? What an unkind thing to do with a lovely bit of crab. My guess is that it wasn’t a lovely bit of crab, but an old leftover bit of crab cocktail brought home from a restaurant she’d wheedled her surly husband into taking her to. On top of the crab, you are directed to throw some flaked coconut. I suppose you could squint at the dish, and imagine being in the Tonga Room, drinking some kind of drink with an umbrella in it, while you poison your family with a brew of green peas and slightly “off” crab. I’m only going to talk about one more piece of culinary Semtex this woman created for her family: Lima Beans Au Gratin. She might have thought that calling it Au Gratin would tease them into eating it. And maybe they did. But that must have been the last time they ever asked her to cook for them. Why? In addition to one pound of dried LARGE Lima beans (“cooked,” the recipe says, but without any suggestion of how long or how) there are directions for making a soupy milky mix of butter flour milk and evaporated milk. The whole thing is then topped with a lot of diced pimento and paprika. Clearly, the idea was to hide the badly cooked Limas under something that must have looked like milk stew. The scary bits of pimento? Who knows. Maybe her family liked pimento and seeing it on top of something lured them into plunging their spoons into the milky morass and actually eating those LARGE Limas. I hope she made it out of Indiana alive and unprosecuted. I’m guessing her life in Indiana did not turn out the way she’d imagined when she agreed to marry Mr. Blender Tuna Mousse. (I haven’t talked about blender tuna mousse for a reason. Were I to describe it, you would dream of it and that wouldn’t be nice.) I’m hoping she ended up in Miami, the place I know she truly wanted to live. In Florida, her hair would always be the color of the sun, her glass always full, the umbrella perched in her drink always open, her television tuned to a lovely soap opera, her feet pedicured and on top of a flowered ottoman, a nice man scheduled to show up every evening at 7:00 with a bouquet of roses and a promise to always, always, always, take her out to dinner. If he knew what was good for him, that is. Not really a comment on your post per se… but just a quick memory about the day you were born. Mom and Dad were playing pinochle the night before you were born. Not the same a bridge, but I remembered the pinochle story. I did end up with a few of Mom’s recipes when I got married and moved away. They included pineapple upside down cake, a seven layer dish that included hamburger. But lima beans? Ewwww…. not even Dad makes lima beans. I am laughing, in my office, out loud right now. The further I read, the louder I laughed. This post was…so…thorougly enjoyable! And revolting, both at the same time. I mean, carrot chowder? yee gods! I love your recreation of this woman, though. Perhaps she’ll make it into the next novel. And, lima beans au gratin? Oh, good lord. Well, anyway, I was feeling a little disatisfied over my lunch of leftover black beans and shrimp because it didn’t just quite hit the spot, but no more. Now I am very, very thankful I didn’t have to eat tuna mousse! Sue, I honestly cannot believe our mother ever had the patience to layer seven of anything into a dish for us. But that pineapple upside down cake sounds delish. I don’t remember it. By the time I came around, cooking stuff like that wasn’t happening very much anymore. It was more a fight for survival, as I recall. Still, I am glad I came into the world on a night when people were playing pinochle — somehow it seems fitting to be remembered as the child who interrupted a card game. Ms. In Between — I think you’re wise to look at your black beans and shrimp in an entirely new way today. We’re all lucky to have escaped Mrs. Tuna Mousse’s fate. I love this project: painting pictures of people using their recipes as clues! It’s a book in the making. 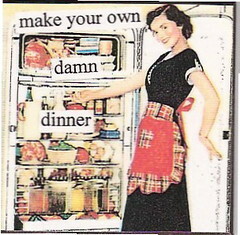 My most precious recipes are kept in a scrapbook given to me by husband with “She Who Must Be Obeyed” on the front. I wonder what message that will send about me to people rescuing my recipes in fifty years time? Bossy little cake-lover, perhaps? I made the pineapple upside down cake in a trailer oven when camping in the mid eighties. Haven’t made it since. Cakes and pies rot at our house. We’ve been using our George Forman grill in the last week to get some protein. Fast and easy. That poor woman and her poor family. Do you think it’s possible that she actually thought those recipes were yummy? Now that’s another story. What must she have been like? Sue — Fast and easy protein sounds like the very thing. Much nicer than pineapple upside down. Hello Debby, No I don’t think it’s even remotely possible she thought those recipes were yummy. Those recipes were weapons in the struggle against the patriarchy. That, or she just liked to cut things out and carefully glue them on index cards. OK, ewww is all I can say. Though I love how you’ve reconstructed her life. Wouldn’t it be wonderful to be able to have a chat with this woman’s family, and find out what they thought of these recipes? Tuna in a blender — that is just wrong. We love to play bridge. Though we eat a lot better than that while we play. Do you play? Okay, I have to confess, this post made me laugh out loud too. I have an overabundance of crazy old recipe cards (current favorite is Salmon-Apricot Souffle) that I’m trying to go through now, and the ingrediants that keep popping up are condensed canned soup, instant potato flakes, and canned fish. Your gin-swilling suburban Borgia is right on. How my parents’ generation survived this kind of cooking is beyond me. Julie, No bridge. I’d love to learn. I like cards a lot: it’s in my blood. When I was little, our whole family would sit around the dining room table and play poker. The chips? Pinto beans. The day I drew four tens, and no one believed I had a good hand, was one of the finest days of my childhood and one I think about all the time. I can still see that pile of pinto beans in front of me. And the piles of nothing in front of my brothers. Hello Ella, Welcome! Salmon Apricot souffle sounds like something you’d whip up in your new blender, with a nice apron over your dress and a stiff drink to get you through. How did they survive it is a fine question. They’re all doing Atkins and exercising, so maybe they didn’t really get over tuna mousse and salmon souffle. What a wonderful post, bloglily – I’m going to treasure the phrase ‘culinary semtex’ – just beautiful. But what is a lima bean? Is it like a lentil? But really – you are on cracking form today. Hmm. The English Lima bean might be called a butter bean, a nicer name indeed. Like all dried beans, the Lima bean need not be revolting. The reason it is must be chalked up to a deep desire among Americans of a certain generation to make young children hate food. I’m glad you enjoyed this post. Later this week, I am going to make something delicious from one of my recipe boxes. It will not feature pimentos or Lima beans. Too funny. I see BlogLily’s “Cookbook of Revolting Recipes” starting a whole new culinary text genre! Please tell me that jello made an appearance somewhere in this recipe box. Please. Hey LK, Oh no not for me. I’m all over the fresh produce and veggie cookbook, the one with the lovely pictures of dewy peaches. And Uccellina, indeed jello’s very important in this box. Cherry jello with pineapple chunks, as I recall. The whole thing then smothered in whipped cream. With pimentos and paprika on top, of course. I remember eating pineapple upside-down cake quite regularly in the ’70s and ’80s. That was in the days when I thought pineapples were bright yellow rings in syrup. I would love to see the Green Soup Plus woman as a character in a novel. Your description of her is so funny. I imagine her as wearing a housecoat with enormous pink flowers over it, that she would assault fashion as well as the tastebuds. Oh, the power of food, be it for good or evil! Thanks again for the sense of humor, I really enjoyed this one. helen, I think her name was Doris. And I think she changed it to Dolores when she got to Miami. Yes indeed, a flowered housecoat. Sort of an anti-Samantha Stevens. I think you have the right vision of the pineapple upside down cake: the pineapple in that cake does not resemble any fruit that grows in nature. Hi Culinae — i’m so glad you made it to your new home safely. For a while there, I thought you’d decided to stop telling us what you were cooking & drinking! It’s great that’s not the case. PS: Here’s a homemaker hint from herb: When entertaining more sleepover guests than available pillows, a well cooked lima bean makes an excellent substitute ( pillow ). This post had me laughing my head off and cringing at the same time. What a trip! And what is this eBay recipe box collection project? Very interesting. First, I LOVED this post. I could see this woman, totally! Ohh Q. That’s such a handy hint. If you can’t get your guests to eat the Lima Bean Au Gratin, at least they can sleep on the damned things. Hello Susan — Because I am an obsessive, odd woman, I’ve become fascinated by the old recipe boxes that have been cast off by the ungrateful children of women who spent a lifetime assembling them. Mrs. Blender Tuna Mousse is an exception — her children did not cast of this recipe box, they hurled it, into what they hoped was an abyss. Good thing an enterprising Ebayer saw its value and offered it up for sale. Welcome Diana. I didn’t know about the lurking, but I’m so glad you’ve come in from the cold! I’ve just spent thirty very pleasurable minutes looking at BookMooch and adding my ten books to it, thanks to you! I love the idea of finding a home for the books I’ve read, and don’t have room for. Thank you for mentioning it. GREAT post! I collect vintage cookbooks and ‘m a lover of old recipes, even if there’s no way I’d ever make or eat them. Are you sure you don’t want to write a novel? The tuna mousse woman would make a great character. Hello Lucette — The Tale of Tuna Mousse has to wait in line until the mystery I’m writing is finished. And then I’m going to write a novel about a young girl who goes to Paris after the second world war ends to bring back a painting for her father, who’s a poet sort of like Wallace Stevens. And then, who knows, maybe a book about rescued recipes, in which Mrs. Tuna Mousse will make an appearance. But I’m afraid of her, so I think maybe she should stay somewhere in the shadows. I’m so glad you stopped by and can’t wait to check out your site! Oh, your Mrs. Blender Tuna Mousse reminds me of the woman I often conjure up when I go through my mother-in-law’s (whom I never had the good fortune to meet) recipe box. She was a woman who, gathering from her sons’s and husband’s description of her, really hated to have to do anything more than sip her martini while reading a good book, when she wasn’t out at the theater, or the symphony, or the opera. It’s very obvious that she was into looking for things that could all be dumped into one casserole dish without too much effort, and thrown in the oven for at least an hour, so she could get back to WAR AND PEACE. Amazingly enough, her family DID take to some of those recipes, and I’ve even learned to like a few of them, like baked bean casserole (a dish with hot dogs that tastes like barbecue) and corn moussaka. Eating stuff like that every night, though? I’m amazed my husband survived. Also reminds me of reading Peg Bracken (I love her, but the recipes aren’t always the most appetizing-sounding fare). I always think people are so lucky when they haven’t read something I adore and get to read it for the first time. And do I adore Peg Bracken. How can you not like a woman who wrote books with titles like I HATE TO COOK and I HATE TO HOUSEKEEP back in the days when keeping a home and cooking were supposed to be women’s dream jobs? My mother (who introduced me to the books) adored her, too.